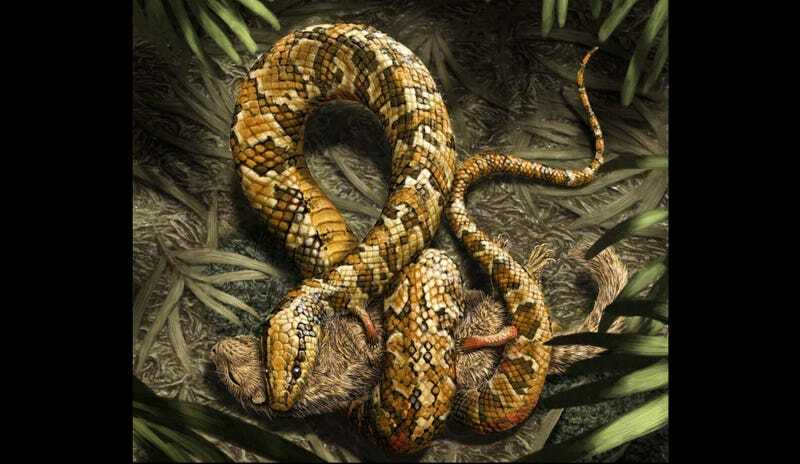 Yes, at least one snake—albeit a very, very old snake—used to have tiny little arms and legs on its lengthy torso. iI want, more than anything else in the world, to see this snake running. Unfortunately, it appears it didn’t use its legs for that. But we can use them to studyv erything from pterosaurs to dragonflies. Tetrapodophis amplectus, as this fossil is called, was found in the Crato Formation in Brazil. The formation gives us a good look at what animals were like a little over a hundred million years ago. Even small, delicate bones have been preserved, which is why we can see the tiny legs on this early snake. It’s also what lets scientists take a look at the size and shape of the head, the shape of the vertebrae, that famously-flexible jaw, and the fangs, all of which show that this wasn’t just some elongated lizard. It was formed like a snake, and for the most part it moved like a snake. The little arms and legs probably weren’t used to get it around—they were used for grabbing prey. The relatively stubby little tail gives scientists an intriguing clue about the origin of snakes. Some believe that snakes were creatures that evolved in the water and slithered up onto the land. The small tail on Tetrapodophis amplectus hints that snakes might have been burrowing animals that crawled up into the light. Naked mole rats—give it a try! Top Image: Julius T. Cstonyi. Fossil Photos: Dave Martill, University of Portsmouth.